Main » 2010 » May » 2 » the Leaves - 2000 - ...are happening! 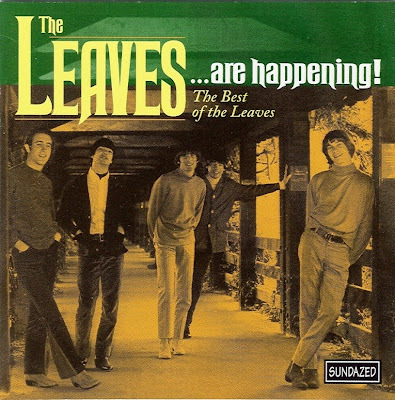 the Leaves - 2000 - ...are happening! Beatlemania influenced Jim Pons to put together a band called The Rockwells, in 1964, whilst at San Fernando State College (California), with the money he was awarded after a $1,000 automobile lawsuit. The original line-up soon set about performing classics like Louie, Louie and Twist And Shout at frat parties. The band's quest for self-improvement soon led them to add John Beck and replace Jimmy Kern with Tom Ray. The band's break came when they got a residency at Ciro's in LA. They then chose a new name The Leaves and had posters designed with pictures of themselves and a marijuana leaf saying 'The Leaves Are Happening'. Pat Boone heard them playing at the club one night and signed them for his Penthouse Production Company. Through this The Leaves were first signed to Mira and released their debut single. The Leaves were the first band to release Hey Joe as a single. David Crosby had first performed the song with The Byrds. They made two previous recordings of Hey Joe before the third fuzztone version, which reached No 31 in the U.S. charts. In England, Jimi Hendrix took it to No 6. By now, Bobby Arlin had replaced Bill Rhinehart on guitar. The Leaves had now won a residency at the Whisky A Go Go in LA, where they topped the bill, which on occasions included The Grateful Dead, Big Brother and the Holding Company and Quicksilver Messenger Service. In 1965 when they appeared at the Golden Bear in Huntinton Beach, The Rolling Stones opened for them! However, their follow-up single Get Out Of My Life Woman was less successful. 1966 saw Roben Lee Reiner become an acid casualty and leave the band. But, as a 'four-piece' they lacked the fullness of sound necessary to make them click.